In the Acoustics Laboratory, the unit of sound pressure level (dB) is realized using a primary system for the calibration of laboratory microphones. The laboratory is equipped with measuring systems for sound level meter verification, for calibration of sound calibrators and for comparison calibration of microphones. 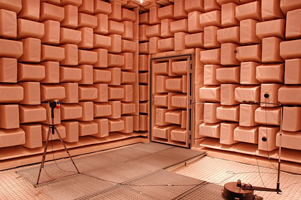 A fully anechoic chamber, built in accordance with the ISO 3745 standard, is used for measurements requiring a free acoustic field. accelerometers by comparison with reference accelerometers, which are calibrated by laser interferometry and vibration frequency measurements, providing traceability to the wavelength and the electrical standards of EIM.